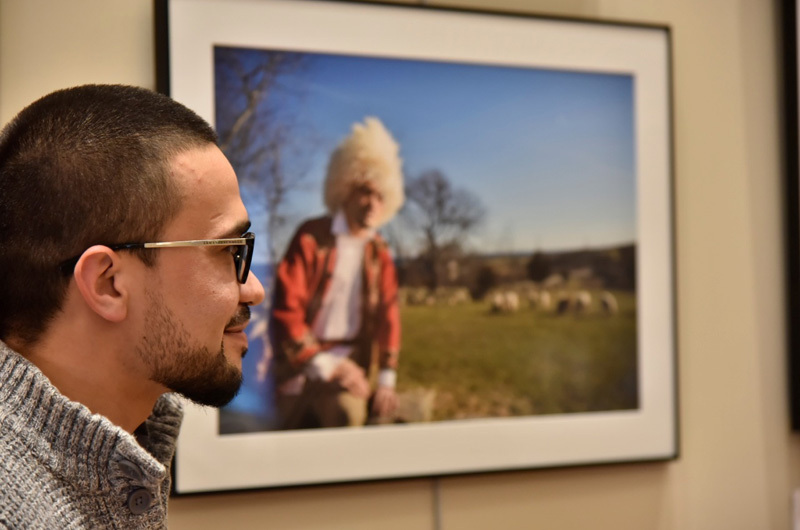 Serdar Mommadov is from Turkmenistan and is one of the subjects of Local Immigrants, a photography exhibit by Mila Lowe. Photographer Mila Lowe honors everything within the borders of her pictures. Her attention to detail is her paintbrush. In her work, once ordinary things — a scarf, an earring, a wisp of hair in the wind — are endowed with new vitality. For her exhibit Local Immigrants, this attention to detail is beautifully applied to showcase the international cultures represented on the Vineyard. 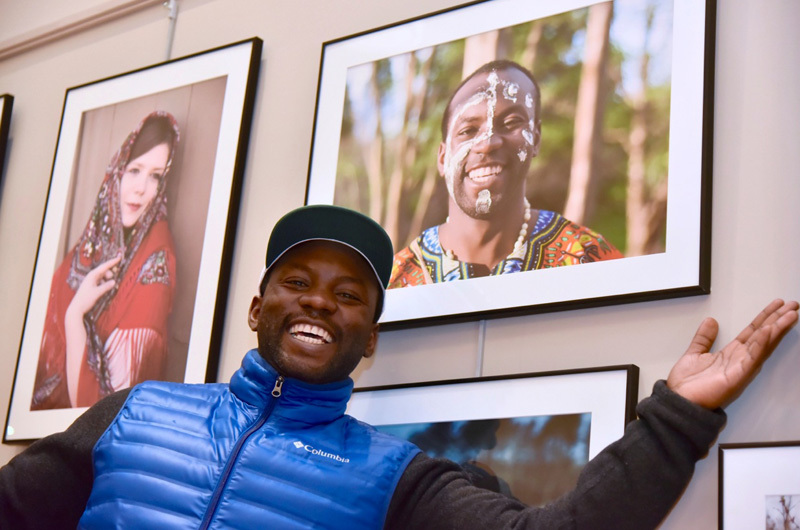 The closing reception for the exhibit at the Oak Buffs library was not cancelled on Saturday despite hurricane force winds, flooding and power outages across the Island the night before. 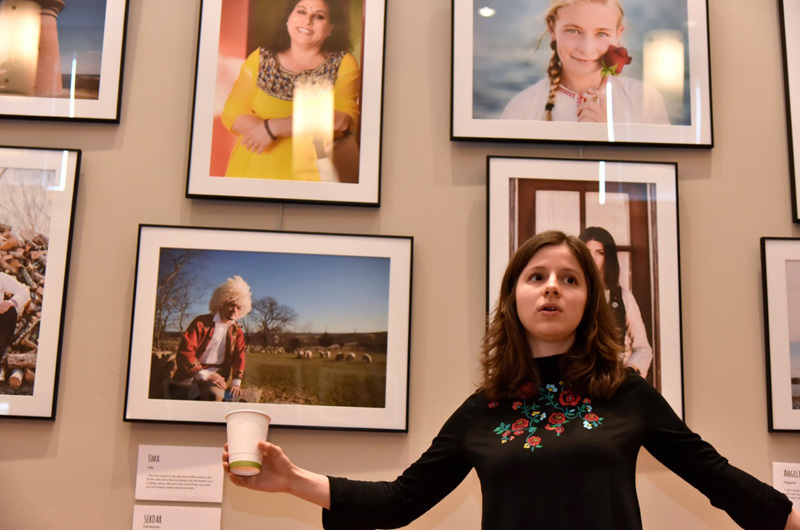 The photographer, two of her subjects and the curator of the exhibit arrived at the library promptly at 2 p.m. to speak on a panel about the art. They (along with a reporter and photographer from the Vineyard Gazette) ended up being the only people to make the trip for the event. The show opened last summer at the Martha’s Vineyard museum. There, each portrait was accompanied by audio from interviews with each subject. Since then, the photographs have toured the Island, going first to the Chilmark Library, then to Oak Bluffs. For the month of March the exhibit will be located in the library at the regional high school. Ms. Lowe, who is originally from Moldova, and her subjects, Martin Boris Takam and Serdar Mommadov, ignored the table set up for the panel discussion and formed a circle of chairs. They quickly fell into an easy conversation with Anna Barber, the exhibit curator, and it began to seem like this was the way it should have been all along. She and Mr. Mommadov had both lost power the night before. “You actually have to sit down and talk to people when the electricity goes off,” said Mr. Mommadov. They compared Island weather to other places they’d lived in the world. Mr. Takam is originally from Cameroon, where there’s a dry season and a rainy season, but he’s also lived in Russia and in Texas. “We have a lot of mountains and green vegetation, and even in the summer you don’t feel the heat that you do when you’re in Houston,” he said. Mr. Mommadov works part-time for a nonprofit organization translating public health information into Turkmen. This is his second winter on the Island, but he has worked in the kitchen at Back Door Donuts during the summer for the past seven years. “We get two or three [people] from different countries every year. Of course I studied international relations, so I get to practice diplomacy,” he joked. In Ms. Lowe’s portraits, her subjects wear clothing from their countries of origin. Mr. Takam wears a brightly colored tunic in his portrait. Americans’ clothing choices were strange to Mr. Mommadov at first, too. “When I came the first time for exchange, I saw people in, like, pajamas in Walmart,” he said. All Ms. Lowe’s photographs in the exhibit use natural light, lending a sense of ease and belonging. Many of them are set against iconic outdoor landscapes on the Vineyard: a lighthouse, a docked fishing boat. Mr. Takam said he loves having the opportunity to share his culture by wearing clothes from his country around the Island.